Britain is divorcing Europe, and though the planned separation is a multiyear process, the repercussions are already being felt. So far, the pound is collapsing, the dollar is acquiring value, and the euro is experiencing a slump. But what does it all mean for your travel plans? If you've got your sights set on a hop across the pond in the near future, here's what you need to know. When Britain voted to exit the EU, the British pound plummeted 8%. Let's put that in perspective: Overnight, the pound's worth dropped below the relative worth of the American dollar back in 1985. It was the currency's single worst day on record. The good news, however, is that the dollar-pound exchange rate is the best it's been in three decades, giving Americans traveling in Britain big purchasing power. If you've never seen the land of Shakespeare and fish and chips — or if you're due for a revisit — now's your chance to do so at a better-than-ever price. Of course, this doesn't mean that your British vacation will be cheap. Even with the Brexit market turmoil, you'll pay far more to sightsee in the birthplace of the Beatles than you would to travel to a country with lower living standards, such as Mexico. But if a trip to Britain is already on your list, now is a great time to pull the trigger. When the value of the British pound dropped, so, too, did the worth of the euro. Down, down, down it went, settling slightly lower than the dollar. This essentially puts all trips to Europe on sale. Not a huge sale, but a sale nonetheless. Americans traveling to Portugal, for example, will have nearly 1% more purchasing power, according to an analysis by Vox. (Hey — every little bit helps, right?) This is especially welcome news considering that travels to Europe were previously predicted to be more expensive this summer than last. If all of Britain is "on sale" to Americans, the inverse is also true: Travel to the U.S. is more expensive than ever for Brits. If this climate persists, it's likely that many British tourists will opt out of U.S. travel until the pound-to-dollar exchange rate stabilizes. It's yet to be seen, but this scenario opens up the possibility of cheaper travel within the U.S. (Think New York, Miami, Los Angeles). "If British tourists, because of currency fluctuations, change their plans or don't come to U.S., you may see some ability to get some better prices in some cities," Mike Stitt, the North American president of Travelzoo, told The New York Times. "We're seeing a little of that effect now with the Canadian travelers. As their currency has plummeted against the dollar, Canadians are staying home." British Airways kicked off the uncertain era following Britain's EU split with a Brexit fare sale. Pricing economy fares from New York to London for as low as $639 round trip, the airline used the country's economic turmoil as a hook to lure in more American tourists. "Your dollar has never gone further," the airline trumpeted on its Twitter account. It's yet to be seen whether other airlines will follow suit. But it's worth keeping your eyes peeled for Brexit-inspired discounts. In the wake of Brexit, the low-cost Irish airline Ryanair said it would be unlikely to deploy new planes on British routes. Instead, the airline said it will funnel its finances toward its European routes. "It's unlikely we will base any additional aircraft in the UK in 2017 as they will be allocated to European Union airports instead," a Ryanair spokesperson told The Irish Times. It's unclear whether other airline carriers will follow suit. But if they do, the price of flights to Britain could very well climb — especially if more low-cost airlines curb their commitment to Britain. A few years out, when Britain's divorce from the EU is finalized, there will be a major change at British airports: Citizens of the European Union will be funneled to the international customs line — the same line that's used by Americans. This could lead to longer wait times. 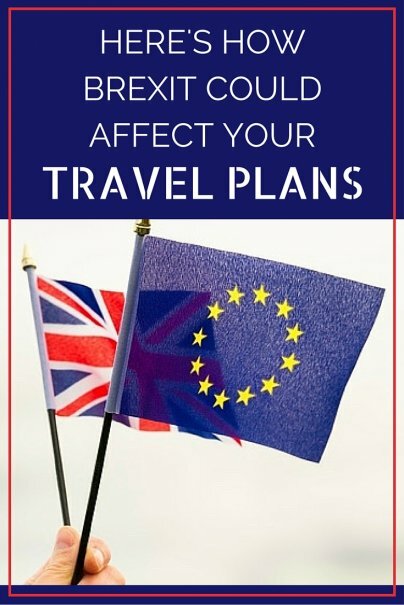 And, if you're traveling through a British airport to a final destination in Europe, you'll likely have to claim and recheck your luggage while going through immigration. A small hassle, perhaps, but who needs another hassle at the airport? Assuming the UK follows through with Brexit, what ramifications do you expect? With the exchange rate as it is, Canada really is a bargain. I'm going to spend this year's vacation in Saint-Hyacinthe, Quebec. Visiting Quebec is like visiting France, but without an expensive air ticket to Paris, and I get to speak French for a week, too. I can easily drive there in one day if I leave home at 7 AM, and it is a pleasant drive through New York State up I-87. Forget Brexit. Visit Canada instead.